The African Union Mission in Somalia (AMISOM) is currently conducting a series of offensive operations against al-Shabaab forces across south-central Somalia. It is doing so in conjunction with elements of the Somali National Army (SNA) and with support from some militias aligned with the Federal Government. Al-Shabaab has offered little conventional resistance, instead usually preferring to withdraw, destroy wells, and try and sow inter-clan conflict in the settlements it has departed. With the imminent arrival of Somalia’s rainy season, the AU and government troops are rushing to gain as much ground as possible. Then attention will turn to whether the Federal Government and AMISOM can provide some form of effective administration and basic services in the newly captured areas. This offensive provides an opportunity to reflect on the current state of the SNA. Not only is the Somali Army an important part of degrading al-Shabaab, it is also a crucial component of AMISOM’s exit strategy and of keeping the peace in Somalia over the longer-term. But the architects of the new SNA face some major political and technical challenges. With enough time and resources, international efforts to reform and enhance the capacity of Somalia’s security sector should be able to overcome most of the technical obstacles. It is the political challenges, however, that are the most difficult, yet ultimately the most important. Trying to build a national army without getting the national politics right is a recipe for instability because the force is unlikely to fight as one and will be viewed as an instrument of particular clan interests rather than representing the Somali state for the benefit of all clans and citizens. Building a “national” army in the absence of a national consensus about what the Somali state is and how it should be governed is a risky endeavor, particularly in the short-term. The immediate political challenge for the Federal Government is how to make its vision of “one Somalia” a reality, in part by building a single, united army that is not captured by particular clan interests and can operate free from the mentality of clannism. At present, however, Somalia remains awash with armed groups and factions. While the Somaliland Armed Forces and Puntland Defense Forces have been relatively stable, in south-central the shifting patchwork of alliances between armed groups is bewildering: some militias are ostensibly aligned with the Federal Government; some are distinctly hostile; while others are concerned primarily with local turf battles and self-defense. But the relationships can change quickly. Just recently, for example, Ahlu Sunna wal Jamaa (ASWJ), an ostensibly government-aligned force, once again fell out with the Mogadishu authorities over how to fight al-Shabaab. In order for the Federal Government to acquire a monopoly over the legitimate instruments of violence and build a genuinely national army, these various armed groups must either be integrated into the new SNA or disbanded. Even leaving aside the big issues in the Somalia-Somaliland relationship, most of these armed groups are highly unlikely to disband. The main short-term focus in south-central Somalia must therefore revolve around deciding which militias should be integrated into the SNA and how. At a minimum this will require significantly more engagement with local/regional community leaders to ensure that they support the idea of recruiting some of their constituents into the SNA. It will also require explicit attempts to eradicate clan mentality and create units comprised of members from multiple clans. So far, the most important examples of this cross-clan approach are the attempt to form the Danab advanced infantry companies – whose soldiers are selected on merit rather than clan affiliation – and the Djibouti Armed Forces’ efforts to train SNA soldiers by removing clan leaders during trainings and mixing up recruits from across different clans. A second political problem is the trade-off between short-term and long-term concerns when thinking about Somalia’s national security strategy. In the short term, Somalia needs an army that can work effectively with AMISOM to defeat al-Shabaab and facilitate stabilization policies across the newly acquired settlements. At present, the Federal Government is working with an army of approximately 22,000 troops. In the longer-term, however, as the conventional threat from al-Shabaab recedes and it turns increasingly to asymmetric terror tactics, Somalia’s army will become less important in dealing with this threat compared to its police and intelligence services. Furthermore, as the levels of external funding reduce over time, Somalia must build an army that can be sustained by its own resources. These two factors mean that Somalia’s army should gradually shrink quite considerably and more resources should instead be given to the police and intelligence services. This poses a difficult challenge: how to build an army for today that does not become a burden tomorrow? In a country that lacked a central government for over two decades there is a long list of technical challenges facing the architects of a new Somali army. Part of the problem is the legacy of previous incarnations of the Somali army. Nevertheless, given an appropriate amount of time, resources and political coordination most of these could be overcome with the assistance of committed external partners – if, the political obstacles noted above can be resolved. If, however, Somalis themselves fail to come to a political settlement over the nature of their polity, no amount of technical training, enhancing, or reforming of the security sector will have the desired outcome. First, there need to be systems in place that give an accurate headcount of the SNA troops as well as their identities and locations. All too frequently the SNA has suffered from soldiers deserting and absconding as well as infiltration, in part because it has been difficult to track who is a member of the national army. Some insiders have used this state of confusion to engage in corruption and fraud. Al-Shabaab has repeatedly exploited it to prosecute attacks on government installations and personnel. Now that a new card-based identification system has been approved it needs to be implemented and enforced. A related point of controversy has been the persistence of child soldiers appearing within the SNA. This should be unacceptable and an effective identification system would make it much easier to stop the recruitment of children. Training and equipping the SNA raises a second set of technical challenges. For too long, there have been multiple and uncoordinated training programs for SNA recruits conducted by a range of external actors, most notably AMISOM, the European Union, Ethiopia, and Turkey. Until recently these programs were mostly run outside of Somalia. With the EU Training Mission now operating in Mogadishu and the Ethiopians having joined AMISOM, it should be easier to organize a coordinated set of training programs for the different levels and specialisms (e.g. aviation, logistics, mine clearance etc.) in the SNA. Nevertheless, it is clearly not ideal that the SNA is going through major training programs while simultaneously trying to conduct joint operations with AMISOM in a war against al-Shabaab. In terms of materiel, the SNA is particularly lacking in vehicles (of all types) and communications technologies, most notably radios. With the partial lifting of the arms embargo the SNA has recently acquired more weaponry and ammunition. However, the UN Monitoring Group on Somalia and Eritrea recently claimed that some of these arms were being deliberately diverted either to fuel clan interests or for economic gain. The Federal Government’s response to these claims was not entirely convincing. The storage and management of ammunition and weapons must therefore be given a much higher priority. The SNA has also lacked crucial infrastructure such as barracks and medical facilities. Without dedicated military barracks, fighters were often left to mix amongst the local population; hardly conducive to stopping corruption, intimidation and infiltration by opponents. This is at least being rectified with the construction of various military camps. It is also significant that a hospital for Somali security forces will soon be constructed. Without access to adequate medical care it is difficult to raise morale and ask troops to carry out risky operations. Morale will also be enhanced if SNA troops are consistently paid a reasonable salary in full and on time. To date, payment of salaries to the SNA has been the responsibility of the Federal Government with the United States and Italy paying additional stipends to some troops. However, senior government officials have previously complained of the SNA’s ranks swelling on pay day only to diminish when fighting was required. Better accounting and financial management procedures will also be needed as well as a much clearer and consistent set of pay scales for the different SNA ranks. A final challenge represents a mix of technical and political aspects, namely, how to identify and deal with disengaging fighters and the concomitant issues related to demobilization and reintegration into either civilian life or the SNA. Unfortunately, a lack of funds has jeopardized the Federal Government’s ability to deal with such fighters. Without adequate financial support, efforts to transition former fighters into alternative livelihoods will fail and “disengaging” will prove only temporary as disgruntled individuals turn against the government or to banditry. Paul D. Williams is associate professor in the Elliott School of International Affairs at the George Washington University. Photo Credit: United Nations via Flickr/Commons. 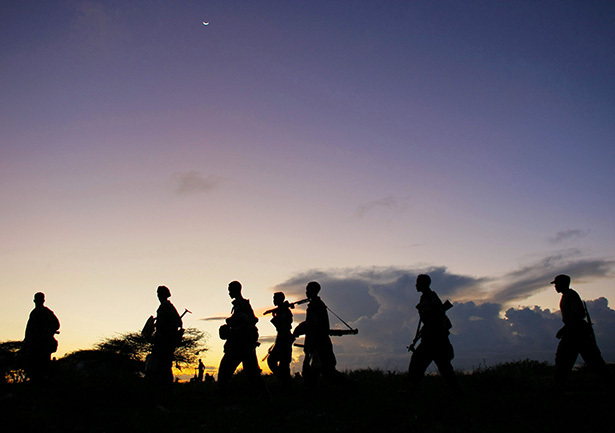 Somali National Army troops advance during an Anti-Shabaab Operation in Somalia.